Everybody wants to grow their business. But if you have never lead a bigger business than where you are today, how do you innovate and grow in a competitive market? For any company that sells a complex product or service, it’s best to have a plan that doesn’t look exactly like your competition. In order to facilitate this plan, DynastyLC uses a system called Catapult. Catapult is designed to work with leadership teams to map out a significantly brighter future. It pushes teams to think beyond their comfort zone and envision the company in five years with 5x growth. 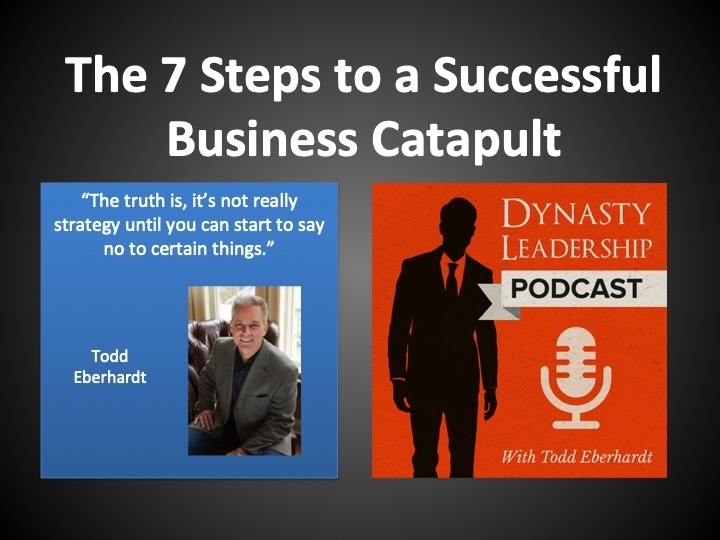 On this episode of the Dynasty Leadership Podcast, roles are reversed as production assistant David Krolczyk joins the show to interview Todd about the Dynasty Catapult process. You can double the size of a business without real change. Simply by applying brute force. Working longer hours, taking fewer days off, but what’s the point? There is no point in growing the business if the payoff just means more work. No one will buy into that plan. To grow 5x, you have to fundamentally change and improve the way the business runs. That means generating new ideas, different value creations, and a plan to pivot. Catapult requires two days of offsite meetings with leadership teams. It creates an environment away from daily tasks to step back and evaluate big picture ideas, and then to create an execution plan that makes dreams a reality. [2:40] Who is Todd and how did it all get started at Dynasty Leadership? [5:45] David does a quick recap of each of the steps in the Catapult process. [7:30] What does the average team look like when Todd is putting together a company? [8:10] How can leaders start to plan for their future vision and story? [10:40] The next step is defining your core values. [12:00] Once you know where your values are, you will have an easier time defining the roles and responsibilities of each staff member. [14:45] Todd takes leaders through a growth exercise where they envision their company at 5X growth. [19:00] How do leaders establish a ‘meeting pulse’ in their company? [22:00] How often does Todd meet with leadership teams to implement this process? [22:55] What kinds of mistakes should you be aware of during this process? [26:25] What have been the biggest takeaways for Todd over the years of using the Catapult process?